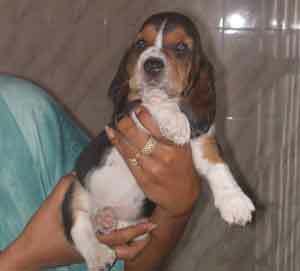 Yet another puppy theft in Bangalore! 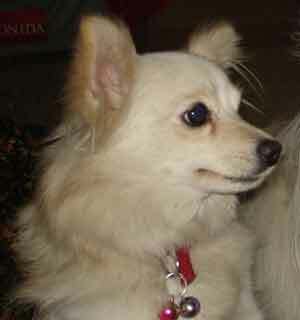 Puppy was stolen from the front yard and carried over bike on 10th July 2006 at 11:45 am. FIR placed with local police station. Please let me know in case in anybody contacts for sale of such a puppy. I am ready to reward Rs 10000/- cash for anyone who would get the puppy and would be very grateful for your co-operation. 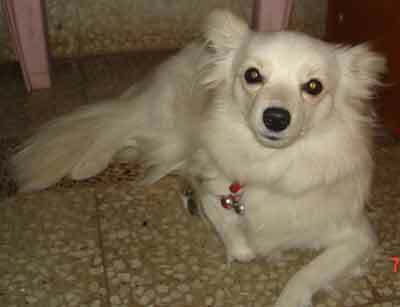 BANGALORE: On Sunday evening, businesswoman Priya Mulani sent a dog to her friend Anu Yusuf in Mumbai by a private airline. Or so she thought. Because late that night she got a frantic call from Anu saying that the pup hadn't arrived at Mumbai. 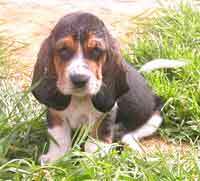 The pup, a one-and-a-half month-old female basset hound, was taken as a consignment along with another great dane pup that was scheduled to leave at 8.40 pm. The hound was duly checked in at 7.30 pm, but the flight was delayed till 10 pm. At 12.45 pm, Anu raised an alarm when she did not see the hound at Mumbai. Mulani rushed to the airport, but at 1.30 pm, there was no one at the airport who had any idea where the pup was. Finally at 4.30 am, the officials tracked down the cargo manager who said the puppies had been placed on a trolley, but had no idea where they were. Only at 10 am did Priya get an answer, the security personnel had left the pups unattended and when the consignments were to be loaded, they found only the great dane pup. "I don't understand why the puppies were left unattended. If anyone sees the pup, please call 98862-84111. 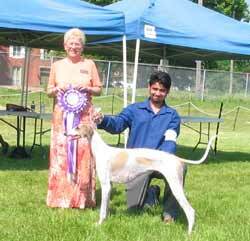 The show was organized by the Rare Breed Club of South Western Ontario, and held in conjunction with the Erie Shores Kennel Club's show on June 5th, 2005 at Caledonia, Ontario, Canada.
" 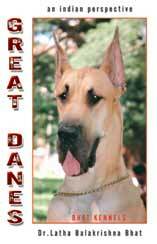 Great Danes - An Indian Perspective "
Contact: Mr.Balakkrushna Bhat.C.R. # 84, "Harshadhama" Sampoorna Avenue, Arcot Road, Chennai - 600026. Animal Birth Control and Anti-Rabies programmes for street dogs! "We will always be with Silva, he is like God for us, we will keep him like a member of our family"
It's been proved yet again that the dog can be a human's best friend, as a pet dog, Silva Kumar, helped save a seven-year-old boy from the tsunami waves. The little boy Dinakaran was being swept away in the waves even as his mother Sangita, a fisherwoman in Pondicherry's Chinna Kalapalatt looked on helplessly. But Silva Kumar jumped into the waves and rescued the boy. "Dinakaran was being swept away with the first rush of waves, but then Silva Kumar jumped into the water and pulled him out, and dragged him to a dry place," Sangita recalls. Sangita says Silva is now dearer to her than her only son. "We will always be with Silva, he is like God for us, we will keep him like a member of our family," she said. Silva's unusual courage and heroism fills both Sangita and her son with emotion as they talk about it, and they say they can't ever repay the debt. The genetically engineered feline, which is expected to be available from 2007, is the first in a planned series of lifestyle pets, Los Angeles-based Allerca said in a press release. We at Dogsindia.com are very proud of Mr. Chandramohan, currently based in the U.A.E. 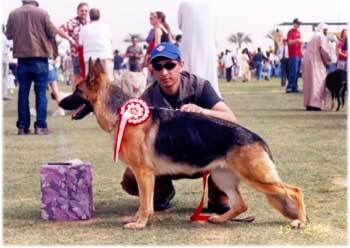 He had been selected as a Dog trainer and handler for a reputed group in the U.A.E, through Dogsindia.com! We are extremely pleased with his achievement as the GSD - Unzi Von Der Hollenberg (Balko Von Der Goldperle X Gundi Von Der Tanzdiele ), a great grand daughter of Seiger Lasso v. Neuen Berg, he had trained and handled, had won the Best Puppy in Show in the year 2003 at the Dubai Pedigree Dog Show, under Mr.Alf & Mrs Coral wood- Ireland . 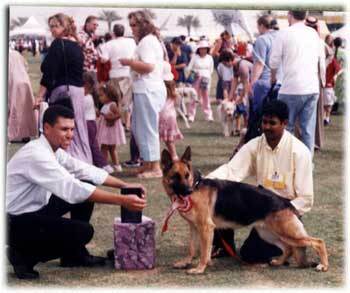 To top it all in on the 20th of February, 2004, Unzi went Best In Show at the Dubai Pedigree Dog Show, under Mr. & Mrs.Bothwell- England. Unzi Von Der Hollenberg is proudly owned by Mr. Mohammed Rashed Khalaf Abdulla Al Otaiba. Keep up the good work Chandramohan and keep the Indian spirit flying high! 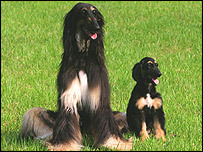 For All Dog Show Results: Click Here! Canines Can Care is a non-profit organisation led by Miss Shirin Dhabhar, who is an associate of world-renowned animal behaviourist and trainer John Rogerson and a member of The Northern Centre for Animal Behaviour, England and The Pet Behaviour Institute, England. She has studied canine training and behaviour for the past six years in England. 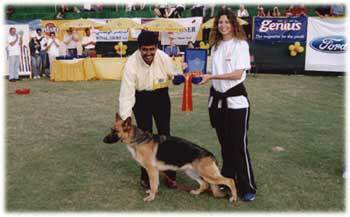 The unit is also led by Mr. Junaid Merchant, an experienced obedience and agility trainer and competitor. We thought you might find it interesting to know that for the past one and a half years our Mumbai based unit has worked to train dogs to aid individuals who are physically challenged. They help the handicapped to achieve their desire to be independent by performing tasks that are physically demanding. - Picking up dropped objects. - Dropping articles in a waste paper basket. - Opening and closing doors. - Speaking on command to alert of an intruder / or barking for help. - Getting help in an emergency by alerting another human being. - Loading and unloading washing machine. - Switching on and off light switches. - Fetching items from a cupboard, shelf, refrigerator or a drawer. - Covering the owner with a blanket. - Acting as a walking support. - Carrying items from one person to another. and many more commands which can be individually suited to the physically challenged person. In addition to the above, studies which have been conducted show that when a disabled individual is paired with a service animal, the physical aspect of the relationship is not the only part that benefits. Through the pairing, a strong emotional bond often forms between the human and canine. As a consequence of this bond, many areas of the owners well-being are enhanced, making that person grow in self-esteem, confidence and independence. India has a huge and ever-growing population of physically disabled people and not enough facilities to help them. Though a lot of Government and Non-Government Agencies are doing their best to alleviate some of their problems, it is but a drop in the ocean. These specially trained dogs provide a vehicle for people to see past the disability and see disabled people as human beings with feelings. In a country such as ours where dogs are loved and appreciated by a select few, we aim to create an awareness of how useful the animal can be, not only to able-bodied people but also to the physically handicapped. If you would like to know more about us please do e-mail us and we will send you more information. 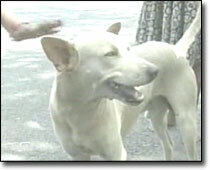 they go wrong in such concerned matters as awareness towards strays. It is a major problem in India . Such animals may have medical problems. But a little consideration towards them could change their life. Another serious problem is that the municipal corporation pounds are not able to accommodate a large number of such animals . Due to inadequate resources the pets in these pounds are not well looked after. stray. It has been more than a year now. The dog is absolutely fit now and very much loved by my family. If you are unable to adopt a dog , you can just contribute to the cause by helping your local organization that deals with cruelty to animals such as SPCA etc.. The least you can do is just be a little more affectionate and concerned towards them and help in spreading this message. A little co-operation from all of you and we can make a difference . MAKE THIS WORLD A BETTER PLACE TO LIVE IN. I request all visitors to this site to kindly send me a feedback and anything interesting you might have to say about Dogs. We shall reserve the right to edit and publish your stories and photographs. From the Web Masters Room.